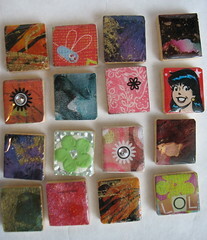 I guess I was lucky the first time I made some of these scrabble tile pendants and used resin to seal them. The first batch were amazing. Well... except for the ones I had to chisel off the tile they were drying on (read all about it here). This batch... not so good. More pictures of works-in-progress at my flickr account (click the picture). I'll have bails glued on and new pictures here tomorrow. It's super hard to find teeny tiny images and still be original. Glue and resin fumes really do make you dizzy & nauseous. Those warnings aren't for nothing! Open a window!!! You really need to watch out for resin seepage and do this: Resin Troubleshooting. They're addicting. I want to make more. Thanks for posting your experience and tips on this - it is great to hear first hand stories from people on how to make things as it makes it much less intimidating to try and even if I fail, knowing other have failed and continue to try encourages me to keep trying.